Home / Latest News / Bringing the Magic of the Huayruros to Florida! Bringing the Magic of the Huayruros to Florida! Let me share with you my history with GALLERY FIVE and I hope you learn more about this fabulous wearable art & fine crafts gallery. After the Buyer’s Market of American Craft show last summer I was contacted by a lady named Paula Coben owner of Gallery Five in Tequesta, FL. She saw my work at the show and she wanted to carry Evelyn Brooks Designs. With this order we had received, my work would be exhibited and sold in FLORIDA. At 1st I thought I have to search where is Tequesta, FL? because I have never heard of it. and also needed to learn more about Gallery Five. Gallery Five opened in November of 1982 featuring fine crafts made by American Artists. You can also visit them by appointment and call them at 561 747 555 to make your appointment. Paula says: We are proud of the success of Gallery Five and pleased that the gallery features work of more than 150 American artists from 40 states, with no imports. And, of course, we invite you to browse through all the virtual drawers of our website to see the hand-crafted wonders by creative artists that we find in travel around the U.S. in our search for fresh and original crafts. We will continue to offer the best service possible, both in our showroom and in our online store. Our best advertising is our satisfied customers. Paula and their team at Gallery Five would like to invite ALL to learn about their outstanding customer service. You can also become a fan of Gallery Five on Facebook. 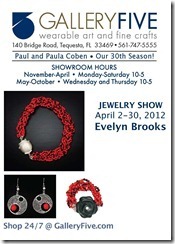 Technorati Tags: evelyn brooks,paula coben,evelyn brooks designs,gallery 5,gallery five,tequesta,fl.